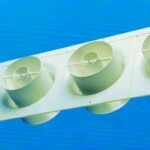 The DCJ Jet Diffuser has been designed to supply cooled or warm air to larger spaces such as exhibition halls, showrooms, factories and shopping centres. 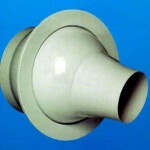 The nozzle has been specially designed to ensure that long throws can be achieved at relatively low noise levels. The nozzle can be freely moved through 60 degrees directionally and 360 degrees rotationally allowing for accurate adjustment of air delivery for spot cooling or between heating and cooling modes. 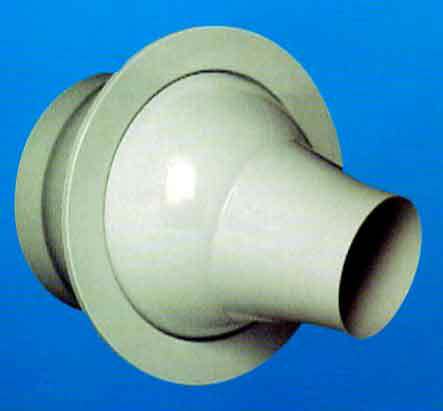 To supply air over longer distances, which is usually a requirement of large spaces as in the examples given above, a high nozzle outlet velocity is always required. It is therefore recommended that the DCJ type diffuser is installed at higher levels and so careful consideration should always be given to the air movement path. Model GBJ is a high quality jet flo diffuser designed for discharge applications such as airport terminals, auditoria, sport arenas, warehouses and shopping arcades. Our GBJ is also available for vertical discharge applications requiring spot heating/cooling in areas such as entrances.